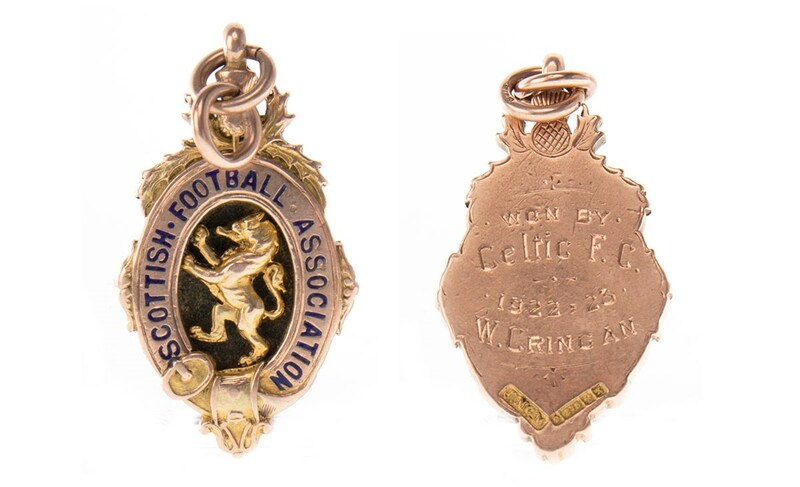 A Scottish Cup medal won by legendary Celtic centre-half, Willie Cringan, almost 100 years ago has sold for £2500 at McTear's. The historical piece was presented to the player following Celtic’s 1–0 victory over Hibernian in the final at Hampden Park on 31 March 1923. There was considerable interest in the fifteen-carat gold medal prior to the McTear’s auction, with the lot eventually selling to a Glasgow bidder in the saleroom. Over the years the medal passed through the Cringan family eventually coming to the player’s grandson, also named William Cringan. Willie Cringan (1890 – 1958) was a Scottish international footballer who played for Sunderland, Ayr United, Celtic, Third Lanark and Motherwell. The player's senior debut for Celtic came in a 2-0 victory over Rangers on the 12 May 1917. He would later go on to captain the team until his departure in 1923. Commenting on the auction, James Bruce from McTear’s said: “It was a very busy auction with both serious collectors and sports fans interested in the medal. There was a real buzz in the saleroom when the bidding started, with the lot eventually selling to a buyer from Glasgow. The fifteen-carat gold Scottish Cup winner’s medal, along with photographs of Willie Cringan featured in McTear’s Works of Art Auction on Friday 23 November. Prices quoted above include buyer’s commission and VAT thereon.